Hello again Readers Mine, and welcome to "Tuesdays with Mollari," where I'll be yammering on about writing Dreams Given Form: The Unofficial Companion to the Universe of Babylon 5. My co-author, K. Dale Koontz, and I have signed a contract with ECW Press (who also published our first book Wanna Cook? The Complete, Unofficial Companion to Breaking Bad), and Dreams Given Form should be hitting bookstores in the fall of 2016. That may seem to be a ways off, but when you're planning to cover 110 episodes of Babylon 5, plus 5 B5 TV movies, the 13 aired and 6 scripted episodes of Crusade, the 9 canonical novels based on J. Michael Straczynski's (JMS) outlines, 12 canonical comics, 1 mini-comic, 6 short stories, Babylon 5: The Legend of the Rangers, and Babylon 5: The Lost Tales... well, you begin to see the work-load we have before us. Dreams Given Form is an ambitious project, and getting all of the above into a single volume is not only going to be tricky, but also will require us to be ruthless when it comes to the length of each piece within the book. Still, B5 itself remains one of the most ambitious shows ever to air on broadcast television, so how better to honor it? So we have begun at the beginning, with a rewatch of Babylon 5, season 1. This isn't a matter of just sitting down and watching the show (again), but of pulling out the trusty lap-desk, legal-pad, and pen and watching it actively, critically, taking notes all the while. 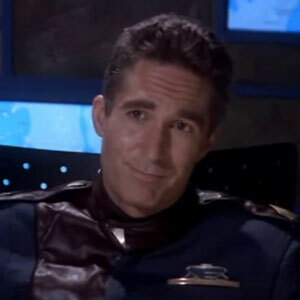 At this point I have to confess that I have never been a fan of the season 1 commander of B5, Jeffery Sinclair (played by Michael O'Hare). I have always much preferred Bruce Boxleitner's John Sheridan, who comes on in season 2 and remains the lead for the rest of the series. Yet in carefully rewatching season 1 this time, I have become more and more impressed with Michael O'Hare's chops as an actor, and find myself liking Sinclair far more than I ever have. He exercises a quiet power, with a soft voice that can suddenly take on a frozen razor's edge when it needs too. O'Hare does a tremendous job of creating a man who is easily underestimated, but is utterly in command of himself and of any situation he finds himself in. I think Sinclair is in many ways a more subtle character than Sheridan, and O'Hare realizes that brilliantly. Yet even I have to admit that, like many many shows, B5 definitely had a case of the First Season Blues, where everything isn't quite running smoothly, and people aren't quite fully settled into their characters. Again this isn't uncommon, particularly in television SF (remember Star Trek: The Next Generation, season 1? "Encounter at Farpoint"? Yeah, First Season Blues.) Despite the often story-halting awkwardness of the Sinclair-Sakai relationship however, Babylon 5 comes through better than most, and JMS is already planting the seeds for the grand arc of the series. Things begin to sprout in the last episode I watched, "Signs and Portents" (1.13), where Ed Wasser (last seen as random C-in-C technician in the pilot movie Babylon 5: The Gathering) returns to the series as the darkly charming,and oh so very dangerous Mr. Morden, asking one of what I term the Two Great Questions of Babylon 5: "What do you want?" Meth Monday: Cookin' in the UK! Hello, Readers Mine! Well, just as soon as I put "Meth Monday" on hiatus, some cool stuff popped up that I figured I probably needed to share with you. First up, to all of our friends in the UK and Republic of Ireland (which are two separate entities, btw! ), keep in mind that we have a great UK publisher in the form of Myrmidon Books, which means that Wanna Cook? The Complete, Unofficial Companion to Breaking Bad, is readily available throughout England, Wales, Scotland, and Ireland! Wanna Cook? on the shalves at Waterstone's Scarborough! Thanks to @ProfPateman for the pic! 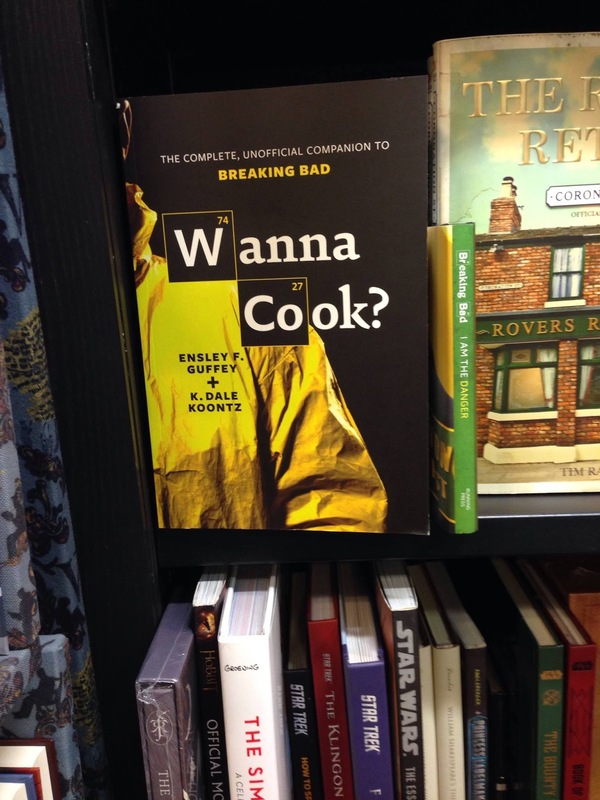 You can also pick up a copy of Wanna Cook? and while away a few hours in a lovely bookshop at O'Mahonys Booksellers in Limerick, as well as fine booksellers throughout the Isles. So get ready to stream all five seasons, pick up your copy of Wanna Cook? and go deep! You can read the whole article and see some of Brad's conversation with Cranston right here. Seriously, how can you not love a show that inspires so many feels?!!!? Hello Readers Mine, and welcome to the first of a new regular column here at Solomon Mao's! 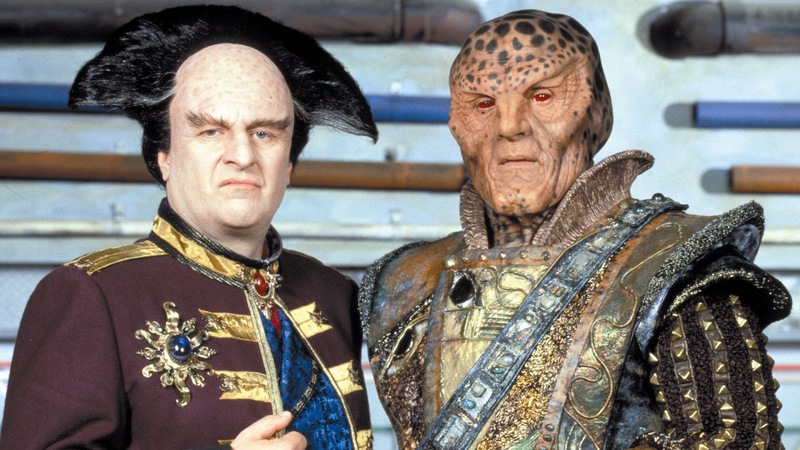 "Tuesdays with Mollari" will function similarly to "Meth Monday" as a space where I'll document my and Dale's adventures as we take on our latest project, a companion guide to the incredible TV series Babylon 5! Our working title is Dreams Given Form: The Unofficial Companion to the Universe of Babylon 5 (the subtitle will likely get tweaked, but the main title is firm). As we did with Wanna Cook?, Dale and I will be using social media to spread the word and (hopefully) build up some excitement, so look for the hashtags #DreamsGivenForm and #DGF on Twitter, Facebook, Google+, and yes, even LinkedIn, for all the latest on the book and Babylon 5 as it comes across our screens. who are a huge part of what makes Babylon 5 Quality TV. Babylon 5 aired from 1993 - 1998, roughly twenty years ago, so some may be wondering why we've decided to concentrate our efforts in the past when we're right smack dab in the middle of a Golden Age of television here in the 2010s. It's simple, really: Babylon 5 is one of the places where the Golden Age began. Created by J. Michael Straczynski (who also wrote an astonishing 92 of the series' 110 episodes), Babylon 5 gave American television an array of firsts: B5 was the first show to introduce the long arc to television, with a pre-plotted storyline that stretched across all five seasons. It was also the first show to use the nascent internet to connect directly with fans as Straczynski reached out through newsgroups and BBS on USENET, GEnie, and CompuServe. This proved so effective that it spurred Warner Brothers to create one of the first official websites for a TV show - ever. To round up this truncated list, B5 was also broke new ground with its use of state-of-the-art (for the time) CGI, which, while it occasionally looks clunky today, nonetheless often remains breathtaking in scope and scale. And then there are the fans - like me. I watched Babylon 5 as it aired, and where I lived at the time, the one station airing the show did so at 1 am on Sunday mornings as part of their "Sci-Fi Saturday Night" programming block, and I would stay up for it every Saturday, without fail, just to see what happened next. Babylon 5 was the first show that made me realize that TV fiction could be something greater than it usually was, that it could be as rich, complex, and rewarding as a great novel, as powerful, moving, and thought provoking as great cinema. For me Babylon 5 was the first show to combine the best of these other media with the serial nature of an ongoing TV show to create something new, and entirely wonderful. Nor was I the only one. Babylon 5 has never been in syndication (though this has recently begun to change), but its fan-base has been tenaciously loyal, keeping the show alive via a host of internet forums that carried over into a myriad of groups and pages on every social media platform. With the advent of the series on DVD, we have acted relentlessly to bring new viewers to the series, who have in turn done the same. With the twentieth anniversary, Straczynski (who has remained an active creator in comic books, film, and television) and the cast and crew have reunited at various cons, bringing a new level of visibility to the show, and making the time ripe, we think, to revisit it with Dreams Given Form. Most of all, perhaps, this is an opportunity to write about the first time I fell in love with a TV show, the first time I experienced the sensation of being in a deep relationship with a show that lasted for years. Not the torrid affair of a binge-watch, or the light friendship of the ongoing sitcom, but a real relationship to which I was deeply committed and devoted,and which broke my heart when it ended, and even more so because it ended so damn well. If that's not something worth writing about, then I don't know what the hell is. So keep an eye out here every Tuesday for "Tuesdays with Mollari," and together we'll see what it's like not only to write about Straczynski's dream given form, but also my own. I'm looking forward to the trip <*>! Hello, Readers Mine! Yes, my "Meth Monday" streak is well and truly broken. *sigh* I blame higher ed, and my being on the other side of the desk for the first time - things have been crazy busy! Yet fear not, Wanna Cook? goes on! The big news is that Wanna Cook? is going into it's second printing! Which means that the first printing has pretty much sold out. This is great news because it means that we have not only made back our advance, but should actually get a check along with our first royalty statement! And that is all thanks to you guys. Thank you so much for continuing to make Wanna Cook? a success. Your posts, pics, reTweets, shares, and - most of all - purchases have made my longest-standing dream come true. Each and every one of you rocks like Dethklok! If you haven't gotten your copy yet, Dale and I will be at Books-A-Million in the Myrtle Beach Mall this Saturday, 13 September, signing books and talking meth from 2 - 5 pm. Is there a better excuse to go the the beach this weekend? Do you really need a better excuse? It's the beach! And Breaking Bad! And us! What more can one ask for? And now it's time for one more announcement: after today "Meth Monday" will become an occasional feature on Solomon Mao's, with posts only popping up as we schedule signings and events, something really cool and/or newsworthy about Breaking Bad comes across our screens, or other Wanna Cook? news crops up. This is to make way for a new, regular column here: "Tuesdays with Mollari," which will document the journey of our next book Dreams Given Form: The Unofficial Companion to the Babylon 5 Universe, coming from ECW Press in 2016. Wanna Cook? and "Meth Monday" have been wonderful rides, and my love affair with Breaking Bad is anything but over. Yet, like all fans, I'm polyamorous, and my passion for Babylon 5 can no longer be denied! I hope you'll stick with Dale and I as we embark on our next project, and that if you are not already a B5 fan, you'll become one as you journey along with us. In any event, thank you again, and be well.